Dental caries is a major health problem worldwide. This disease results from improper interactions between oral microorganisms and host that stimulate the establishment of cariogenic biofilms on tooth surfaces, whose high and sustained acidogenicity promotes demineralization of tooth tissues. These interactions are modulated by environmental factors, among which diet has significant impact, especially regarding its carbohydrate content. Although microorganisms are recognized as having a central role in dental caries, current approaches for intervening in the establishment of cariogenic biofilms are limited. In this review, we focus on clinical studies supporting the role of mutans streptococci (MS) as promoters of cariogenic microbiota. Functions of MS in this process are analyzed under the current knowledge about the genetic and phenotypic diversity of Streptococcus mutans, the most well-known MS species. Effects of host immune responses on the establishment and pathogenesis of S. mutans are also discussed, further encouraging studies testing anti-MS therapies. Studies using animal models of dental caries have pointed to mutans streptococci (MS) as agents promoting establishment of cariogenic microbiota, and have shown that once transmitted from infected to uninfected rodent, these bacteria induce dental caries in the presence of a sucrose-rich diet (reviewed in ). A large number of studies have identified several molecular mechanisms by which MS efficiently enhance biofilm biomass in the presence of sucrose, and promote ecological shifts that lead to emergence of acidogenic and aciduric organisms [2, 3, 4, 5••, 6]. Moreover, several clinical studies further indicated the role of MS in caries development in humans . Two species of MS are exclusively detected in humans, Streptococcus mutans (serotypes c, e, f and k), and Streptococcus sobrinus (serotypes d and g) [8, 9]. Most of the molecular and clinical studies analyzed S. mutans, which is the most prevalent species. However, several observations challenge the notion that MS are the major agents implicated in the pathogenicity of dental caries: 1) MS are ubiquitous in the human populations and over 50 % of MS carriers do not show development of caries lesions in one or two years of follow-up , even when at heavy oral levels [11, 12, 13••]; 2) MS are part of a highly diverse group of microorganisms, including cultivable and uncultivable bacteria [14, 15••, 16] and fungi ; and 3) MS are not always detected in biofilms associated with a number of initial caries lesions [10, 14, 18]. The ability of MS to promote disease depends on a complex web of events of bacterial interactions with host defenses and host microbiota [19, 20, 21]. As analyzed in this review, the outcome of the host encounter with a S. mutans strain seems to depend on: 1) the virulence traits of the strain(s), 2) the host responses at the time that the strain is encountered and becomes established, and 3) the endogenous (e.g., oral microbiota) and external conditions (e.g., sucrose consumption) that can influence the bacterial−host interactions. Thus, for translational application in cariology, two important issues need to be addressed: first, whether it is possible to interfere with MS (or other pathogenic species) establishment in dental biofilms through therapeutic tools that reduce the impact of socio-cultural factors associated with unfavorable health and/or dietary habits; second, whether these anti-MS therapies would indeed lead to control of caries development. The studies reviewed here might provide answers to these questions; further encouraging research to identify the best panel of therapeutic targets, and to analyze the effects of blocking already characterized targets to control the establishment of cariogenic biofilms. Systematic analyses by Tanzer and colleagues of 313 articles published between the years of 1966 and 2000 indicated that MS are associated with dental caries initiation . A 2-year prospective study of 530 intact tooth surfaces in 28 subjects showed development of caries lesions in 53 % of sites with detectable levels of MS, but in only 8 % of sites without detectable MS . The advances in molecular-genetic technologies provided a broader view of the microbial diversity of the oral biofilms from subjects with different statuses of disease activity [14, 15••, 16, 23, 24]. 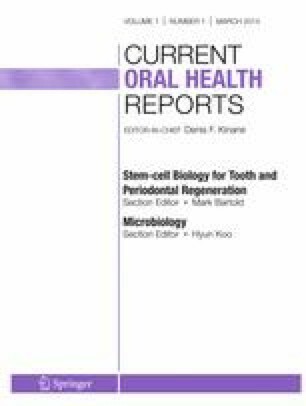 Cross-sectional studies focused on determining the biofilm microbiota on healthy and affected tooth sites (from white-spot to dentin lesions) within subjects with distinct degrees of caries activity [14, 15••, 16, 25]. A significant number of non-MS organisms were associated with caries, including Lactobacillus spp., Actinomyces spp., Bifidobacterium dentium, Scardovia spp., Veillonela spp., Atopobium parvulum, Dialister invisus, and other non-MS streptococci (e.g. Streptococcus vestibularis, Streptococcus salivarius, Streptococcus sanguinis, Streptococcus mitis) [14, 15••, 16, 24, 25]. Levels of MS could not be significantly associated with white-spot lesions in permanent teeth in one study . In contrast, a longitudinal study of microbial communities of tooth biofilms in permanent dentition significantly associated S. mutans with white-spot lesions, along with other 25 taxa . Additionally, levels of MS on intact tooth sites were significantly associated with latter development of lesions in caries-affected young children [15••]. In young children without detectable signs of caries, levels of Veillonella parvula were significantly associated with future development of caries lesions [15••]. Interestingly, V. parvula strain PK1910 strongly promotes S. mutans growth in co-cultures with an initial proportion of ≈2 % S. mutans, 10 % V. parvulla and 88 % S. gordonii [26•]. S. gordonii and S. sanguinis are known to antagonize S. mutans growth by production of H2O2 . The discrepancies regarding the most predominate non-MS species in cariogenic biofilms detected in molecular studies might be due to variations in methods and difficulty to define specific stages of disease. Additionally, there may be differences in the events of biofilm initiation and microbial succession during initial establishment of disease compared with established acute forms of caries, e.g. severe early-childhood caries (S-ECC). Nevertheless, non-MS streptococcal species are frequently found in biofilms of initial lesions [14, 15••, 24], confirming previous studies using culture methods [28, 29]. Non-MS streptococci represent the major pioneer species of teeth in humans ; thus, it is not surprising that these organisms are consistently observed with initial lesions. However, isolates from biofilms associated with lesions may be represented by atypical strains with potent acidogenicity and acid-tolerance in cariogenic biofilms . Non-MS streptococci species can induce caries in germ-free rats, but the extent of disease activity is generally low compared to MS [32, 33]. Interestingly, associations were noticed between the ability to produce extracellular polysaccharide in vitro and the ability to cause dental caries in rats among non-MS streptococcal strains . While the molecular mechanisms through which non-MS organisms participate in caries initiation are unclear, there is evidence that some of them may benefit from MS-derived factors present in saliva or in the acquired pellicle of tooth surfaces [34, 35, 36]. For example, S. sanguinis is a pioneer colonizer of saliva-coated tooth surfaces, likely due to its large array of adhesins , but does not form stable biofilms in vitro in the presence of sucrose, even though several strains produce glucosyltransferases (Gtfs) able to synthesize water-insoluble glucan (WIG) from sucrose . However, biofilm formation is significantly enhanced when S. sanguinis strains are mixed with MS-derived purified Gtfs . Moreover, S. mutans-derived active Gtfs bind to a variety of non-MS oral bacteria (e.g. Streptococci, Lactobacilli and Actinomyces) . Of note, saliva samples from children with S-ECC contain significant amounts of S. mutans Gtfs . Additionally, Gtf-encoding genes are induced in S. mutans by co-cultivation with Streptococcus oralis and A. naeslundii [39•]. Interestingly, even in proportionally low levels in mixed-species cultures, S. mutans is able to alter the three-dimensional structure of biofilm in the presence of sucrose, creating highly acidic microenvironments, which in turn promote local growth of aciduric microorganisms [39•]. More studies are also need to look for the effects of MS factors on other organisms associated with cariogenic biofilms [35, 40•]. Prospective studies of young children during the development of their oral microbiota provide data compatible with a role of MS in dental caries pathogenesis . MS transmission to children could be controlled by suppressing the cariogenic microbiota of mothers until their children were 3 years old. This approach showed extended effects, since at 7 years of age only 46 % of children of treated mothers were MS-colonized, compared to 95 % of children of untreated mothers. MS suppression in mothers was highly dependent on patient commitment, as it involved intense educational approaches to reduce sucrose consumption, to improve oral hygiene, and included antimicrobial therapy [42, 43]. Absent or MS colonization later than 3 years of age significantly reduced development of caries lesions at the ages of 7  to 19 years [44, 45••], compared to early MS-colonized children. Thus, it is possible to control MS transmission in humans, which has protective effects in caries development. MS are more frequently acquired early in life, mainly during a period of 1.5 to 2.5 years of age, which has been designated the “window of infectivity” . Although MS can be acquired before [11, 12, 13••, 45••, 46] or later than the so-called window of infectivity [48, 49], it seems that the risk for MS establishment decreases when the primary teeth complete eruption (by 2.5 to 3.0 years of age), even in MS-challenged populations . In populations with high sucrose exposure, fluctuations in MS oral levels are observed during the first 3 years of life; about 35 % of 1 to 2.5-year-old children with high levels of MS show a decrease in MS levels 1 year later, in a fashion not explained by differences in sucrose intake . The establishment of a competitive microbiota and the maturation of the host adaptive immune responses  could explain those observations. In MS-challenged populations, IgA antibody responses to MS antigens are more intense during 1 to 2.5 years of age compared to older children or even adults [50, 51••]. Common members of the health-associated dental microbiota, e.g. S. sanguinis, are also known to inhibit S. mutans colonization [27, 52]. To understand the roles of MS in dental caries development, it is important to consider S. mutans strain diversity and its influence on virulence. Some of the first studies addressing this issue compared the ability of clinical isolates of S. mutans and S. sobrinus to induce dental caries in a hamster model . MS diversity was later shown to influence the ability of individual MS strains to be transmitted from mother to child, as strains producing a more efficient array of bacteriocins were more frequently transmitted between mother−child pairs compared to strains with a lower spectrum of bacteriocin production [54•]. Thus, S. mutans strains differ in their competitive ability to establish in the oral microbiota. The phenotypic diversity of S. mutans was explored when tracing the sources and routes of S. mutans transmission to children during the development of the oral microbiota [55, 56]. Genotyping methods, used to track strains within families, day care schools and other populations [57, 58], identified both vertical and horizontal routes of transmission [12, 47, 55, 59, 60•, 61]. Genotyping studies also demonstrated that S. mutans strains acquired early in life tend to persist in the oral cavity for several years, although specific strains can be lost or acquired during life [48, 62, 63]. These studies raise the question of whether this diversity could influence the disease development within MS-colonized subjects. The sequencing of the strain UA159 isolated from a caries-active child was critical to understand S. mutans biology [64•]. Further comparative analysis of S. mutans genomes revealed that S. mutans have a core genome formed by genes present in all the strains, and a dispensable genome, composed of strain-specific genes [65, 66]. The S. mutans dispensable genome includes virulence genes involved in biofilm formation, sugar metabolism and bacteriocin production, and a class of laterally acquired genes including genomic islands with atypical C + G contents . The sequencing of the genomes of 57 S. mutans isolates from eight countries confirmed that the S. mutans genomes are dynamically altered mostly by lateral gene transfer, but the core genome includes a set of exclusive genes not present in non-MS streptococci [67•]. Interestingly, the S. mutans-exclusive core genome contains a significant proportion of genes encoding small peptides that are potentially involved in cell signaling and gene regulation [67•], implying that an important trait for S. mutans biology relies on its ability to rapidly respond and adapt to environmental changes. The dynamic adaptation of S. mutans to oral niches most likely involves several processes, including gene expression changes, post-transcriptional regulatory mechanisms, selection of polymorphisms associated with specific enzymatic/protein activities, and acquisition or loss of genes [67•, 68, 69, 70, 71•, 72••]. Remarkably, no significant differences were observed in virulence gene content, including those encoding Gtfs (gtfB/C/D), glucan-binding proteins (gbpA/B/C) or involved in acid production and tolerance (atpA, fabM) among S. mutans isolates from caries-free children versus children with S-ECC , although genes with putative roles in bacteriocin production, carbohydrate metabolism or other unknown functions were often found to be different between isolates of low-caries and caries-active children . S. mutans strains clearly differ with respect to their ability to form biofilms in vitro [13••, 71•, 73]; these abilities are positively associated with the diversity in amounts of GtfB and GtfC (enzymes that synthesize WIG) produced in vitro , as well as with amounts of glucan-binding protein B (GbpB) [71•], a surface protein involved in cell-wall biogenesis and biofilm formation . Patterns of production of these virulence proteins appear to be strain-specific [60•, 71•, 73]. Prospective comparisons among S. mutans isolates from children 1 to 2.5 years of age carrying significant oral levels of MS revealed that isolates from caries-free children produced significantly less WIG in vitro than strains isolated at baseline from children who developed a mean of four caries lesions 1 year later [13••]. The synthesis of WIG in vitro by the colonizing strains was significantly associated with future development of lesions. Although a high diversity in acidogenicity and aciduricity was also detected among strains (final pH ranging from 3.89 to 4.36), no significant associations with disease activity were verified [13••]. Thus, once MS are established, the acidogenesis of biofilms may be sustained by several organisms [15••, 16, 31, 75]. Similar associations between syntheses of WIG with disease were also detected in young adults . Differing capacities of WIG production could not be associated with polymorphisms in genes encoding GtfB and GtfC, because these enzymes show large sequence diversity . However, phylogenetic analyses of gtf genes of S. mutans and non-MS streptococci indicated amino acid changes clustered in the catalytic domains of these enzymes , which may explain the differential activity of the enzymes and/or type of glucan produced. Additionally, analyses of the diversity of bacterial regulatory systems include the characterization of signal transduction systems designated as two-component regulatory systems (TCS) , which are widely applied by prokaryotic organisms to rapidly sense and respond to environmental stimuli . The number of TCS vary from 12 to 14 among S. mutans strains [80, 81]. There is also high variation in the S. mutans quorum-sensing pathways that is important for biofilm formation [72••, 82]. The high diversity in the activities of genes encoding transcriptional regulators (vicR, comE, rr11 and covR) of S. mutans virulence genes (including gtfB/C, comCD, gbpB, and gbpC) indicates that the TCS regulatory networks may be strain-specific . By identifying the regulons of TCS involved in biofilm formation through direct regulation of gtfB/C and gbpB (VicRK and CovR), a set of genes involved in cell wall biogenesis was found necessary for S. mutans to initiate biofilms in the presence of sucrose . Those include genes encoding murein hydrolases (LysM, SMU.2146c, SmaA) and a gene putatively involved in the surface attachment of teichoic acids (epsC) . Interestingly, these genes are not involved in planktonic growth phenotypes . The mechanisms of cell wall biogenesis and turnover in S. mutans are largely unknown, but analysis of 15 clinical S. mutans strains revealed a high diversity in patterns of autolysis, likely as result of different activities of murein hydrolases and other cell wall components [72••]. These results indicate ecological relevance of S. mutans cell wall diversity. S. mutans are known to differ from other oral streptococci with respect to cell wall components, including amounts of lipoteichoic acid (LTA) . Soluble LTA seems to modulate Gtfs adsorption to tooth surfaces  and is found in high amounts in cariogenic biofilms . LTA might be also involved in S. mutans interactions with other bacteria in biofilms [85•]. Further analyses of S. mutans cell wall components may reveal novel therapeutic targets. The oral cavity is protected by a large number of soluble and cellular components of the innate and adaptive systems. The unique individual patterns of adaptive immune responses occur in part because of the enormous diversity of antigen-specific receptors of T and B lymphocytes and the complexity of the events involved in the activation of effector functions in these cells . Major components of oral specific immunity are the SIgA antibodies, which are dimeric forms of IgA associated with a secretory component that confers antibody resistance to bacterial and host proteases . The functions of salivary SIgA in controlling bacterial colonization include bacterial agglutination, blocking of adhesins to salivary pellicle or other biofilm components, interference in enzymatic activities important for colonization and immunomodulatory activities [87, 88]. The pioneer colonizers of the mucosa and teeth (S. mitis and S. sanguinis, respectively) produce proteases that can cleave the most abundant SIgA antibody isotype in saliva (SIgA1), perhaps enhancing the colonization potential of these bacteria. Abundant evidence indicates that the mucosal immune response matures rather quickly in the infant. In the oral cavity this phenomenon is evidenced by measureable levels of salivary IgA antibody reactive with pioneer oral organisms within the first weeks of life . Even these earliest responses differ in specificity, amount, timing and IgA subclass among infants, emphasizing the individuality in the development of and response to the emerging microbiota. Interestingly, antibodies reactive with pioneer microbiota and S. mutans are detected in the oral fluids of neonates . The salivary SIgA antibody to virulence antigens of these organisms showed specificities distinct from those of SIgA in the respective maternal milk , suggesting active immunological interactions very early in life. As oral habitats become more diverse with age, so do the consequent microbial challenges to the mucosal immune system. Conditions that favor MS colonization bring with them the potential for responses to virulence-associated components. However, children can respond differently to these organisms, influenced by factors such as extent of colonization or maturation of immune response. In fact, siblings often demonstrate unique patterns of antibody specificities, despite being challenged with the same maternal subspecies [21, Nogueira, unpublished observations]. Although it is clear that most children demonstrate salivary antibody to MS persisting through adulthood, the relationship of antibody levels to MS colonization and disease remains somewhat elusive [21, 90]. Nogueira and colleagues [51••] investigated patterns of specificities of salivary SIgA in a longitudinal study of children initially 6 months old. In this population of children heavily exposed to sucrose and to MS, children with natural immunodominant responses to GbpB (a potential vaccine target) were less susceptible to S. mutans acquisition. About 76 % of the babies in which MS were not detected showed robust amounts of salivary SIgA antibody to GbpB, while only 38.1 % of children already colonized by MS showed SIgA reactive with this antigen [51••]. Early colonized children developed one to seven cavity lesions at the end of the study, while non MS-colonized children remained free of lesions . These studies indicated that children under heavy MS challenge can mount secretory IgA responses to S. mutans-specific antigens in the first year of life, and that vigorous immune responses to antigens important to colonization may influence susceptibility to MS acquisition and caries development. The origin of early immune responses reactive with MS antigen epitopes may stem from more than one source. Infants may respond to these epitopes following transient exposure from caregiver saliva early in life. In addition, pioneer microbiota may initiate salivary IgA responses that react with, and possibly prime responses to, MS . Several MS virulence components share MHC Class II binding peptides with pioneer colonizers’ protein homologues . Furthermore, culture supernatants of S. mitis and S. salivarius contained antigens reactive with rat IgG or chicken IgY antibody to purified S. mutans GbpB. Mass spectroscopic analysis identified homologues to GbpB in pioneer streptococci. Associations between caries development, colonization with caries-associated microbiota, and immunity were explored in children during the initial transition to mixed dentition. Caries-free (CF) and caries-active (CA) children were evaluated at 3−4 years of age and a year later, for total levels of salivary IgA and IgA antibody reactive with S. mutans epitopes . As expected, MS was associated with caries development in this population, and salivary IgA antibody levels to Gtfs, GbpB and Antigen I/II SBR increased in both groups. However, in the CF cohort, salivary antibody levels to seven peptides associated with presumed domains of biological importance increased at follow-up, in contrast to increases to only three peptides in CA-cohort salivas. Similar findings were previously observed in older children . Multivariate modeling showed that a lower baseline level of salivary IgA anti-GbpB was associated with higher dental caries-risk , further indicating that the breadth of mucosal IgA response to S. mutans virulence-epitopes may influence the degree to which these microorganisms can cause disease. There are recent reviews regarding possible anti-bacterial therapies to control dental caries . Infectious diseases have long been intercepted by enabling host defense mechanisms through immunization prior to infection, or by providing external sources of antibody directed to the disease-responsible entities. These approaches have often been successful, are generally cost-effective, and can reach a large percentage of the population. Thus, active and passive immunization strategies have been pursued to deal with organisms implicated in dental caries [95•], and have the potential to complement existing anti-caries regimens [41, 42, 43]. Although several microorganisms have been associated with various forms of dental caries, MS have been the foci of these immunological approaches. MS offer obvious cell wall and extracellular targets that are central to their attachment and accumulation in the oral biofilm. As the oral microbiota becomes more fully catalogued, other acidogenic microorganisms separately, or in community, may be found to participate in disease development [15••, 16, 23, 24]. Nonetheless, MS remains prominent in most molecular genetic profiles of incipient dental disease; thus, it continues as a reasonable vaccine target. Adaptive immune regimes using protein-based vaccines have shown that induction of salivary IgA antibody to components of MS that are responsible for adhesion to the tooth surface (antigen I/II), for glucan formation (Gtf), or for aggregation via Gbp’s, inhibits dental caries formation in experimental systems . Thus, proof of principle exists for a dental caries vaccine; at least one approach is under commercial development [personal communication]. Considerable attention has also been focused on effective adjuvants  and on creating protein-based or peptide-based constructs that increase the breadth of protection through biochemical or recombinant combinations of putatively protective epitopes from these virulence components. Conjugating Gtf to glucan has also been shown to extend experimental protection to the two MS species pathogenic in human [98; unpublished observations]. Mucosal immunity, as expressed in the saliva as secretory IgA, is considered to offer the most obvious mechanism for provision of potentially protective antibody. Nasal antigen application is being pursued as a primary site for delivery of antigen to inductive sites that result in salivary IgA antibody formation [96, 97]. Inducing protective levels of salivary antibody prior to establishment of cariogenic streptococci continues to be a goal. DNA vaccines have also been explored for their ability to provoke protective responses. Theoretically, this approach could permit, depending on the construct, expression of a combination of MS virulence components and might result in an extended duration of epitope expression at the desired site. DNA vaccine constructs containing the A-P fragment of the S. mutans pac gene , and/or catalytic and glucan binding fragments from S. mutans GtfB or S. sobrinus Gtf genes, cloned into plasmid vectors, have been delivered experimentally via routes similar to those used for protein-based vaccines. Recent experiments have concentrated on optimizing intranasal administration , adjuvant composition, and use of combinations of DNA vaccine-protein for immunization . Adopting the adaptive approach in humans has been delayed, in part, by the lack of acceptable adjuvants and reluctance to add another active vaccine to those currently recommended for pediatric use. Passive immune approaches, which do not have these issues, thus hold some promise. IgG or IgY antibodies to intact cells or virulence elements, when introduced into the oral cavity by topical application, diet, drinking water or intravenous transfer, have each reduced dental caries in experimental animals during challenge with MS . Small scale clinical trials using topical application of monoclonal/ transgenic reagents directed to S. mutans cell surface epitopes were met with some success . Kruger and coworkers [102•] designed a single-chain variable fragment (scFv) with anti-adhesin properties and expressed it on the surface of Lactobacilli, which, after colonizing the oral cavity, could inhibit experimental caries. Dietary administration of human scFv antibody to Gtf epitopes was also shown to modify experimental MS infection [91; unpublished observations]. Thus, considerable experimental evidence exists for the vaccine approach. The current challenges of this approach include the likelihood of multiple cariogenic species, the ability to induce sufficient and long-lasting levels of protective antibody in young children, and, especially in the case of passive immunity, the requirement to continuously apply protective levels of antibody to address a chronic infection. MS oral colonization promotes dental caries development in humans. This disease activity is affected by the timing of MS establishment in the oral microbiota, which is modulated by host responses during the course of colonization and by external and microbial factors that enhance or mitigate MS competitiveness. The most prevalent MS species, S. mutans, shows high genetic diversity, and clinical studies highlight its significance in strain ability to promote disease. The role of S. mutans in cariogenesis is likely not to be entirely dependent on bacterial levels, since virulence factors expressed by this species are shown to alter the biofilm structure and to promote ecological shifts leading to an acidogenic and acid-tolerant microbiota. Other organisms in the biofilm may also participate in caries development, but further studies are needed to identify mechanisms by which non-MS organisms would drive (in combination or not with MS) the ecological shifts leading to cariogenic biofilms. Finally, there is evidence that natural salivary IgA antibody response of children to MS virulence-associated antigens affects susceptibility to MS colonization, supporting the application of anti-MS vaccines. Combination of different therapeutic approaches to control caries disease will likely be necessary to benefit susceptible populations. The authors’ research in this area was supported in part by research R03-TW-06324 (R.O.MG. ), R90DE022529 (M.I.K. ), R37 DE06153 (D.J.S. ), grants from the National Institute for Dental and Craniofacial Research (NIDCR/NIH). R.O.MG also received support from Fundação de Amparo à Pesquisa do Estado de São Paulo (FAPESP, proc. 07/56100-2 and 09/54182-7). The authors declare no conflicts of interest with respect to the authorship and/or publication of this article. Dr. Renata O. Mattos-Graner declares no potential conflicts of interest relevant to this article. Dr. Marlise I. Klein has received a grant and support for travel to meetings from NIDCR/NIH. Dr. Daniel J. Smith has received a grant and support for travel to meetings from NIDCR.